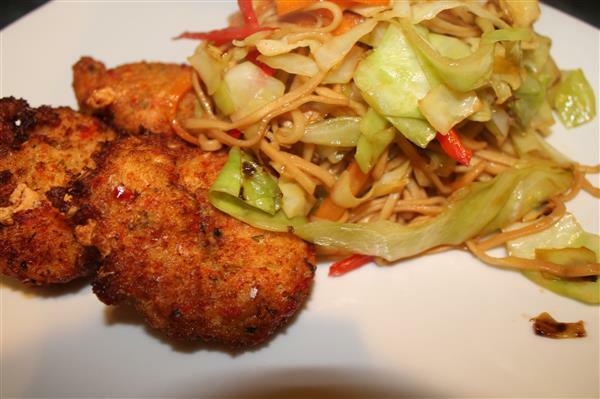 Thai Fish Cakes with Noodle Salad – Made these once before, they tasted brilliant, so we made them again and put them on FADHoppers. Not much more to say than they taste awesome! Mix to a smooth paste adding coconut milk and egg. Chill in refrigerator overnight or for at least two hours. Half-fill a heavy-based frying pan with oil and heat over a medium to high heat. Shape the chilled paste into fishcakes. Fry until crisp and brown, turning once during cooking. Set aside to drain on kitchen paper. Boil water in a kettle and add to a pot. Cook the noodles in the water for a few minutes. Heat olive oil in a wok. Cook the ginger, chilli, cabbage, carrot and pak choi for a few minutes in the wok, until the cabbage has wilted. Add the noodles to the wok and mix. Add a good glug of soy sauce.